Computing in K-12 educational environments takes creativity especially when resources are scarce. One of the big initiatives that I worked on at/for Arizona School for the Arts was the creation and standardization of mobile computer labs (MCLs for short) around the campus. The centerpiece of this initiative is a fleet of fifty MacBooks — more on that in another post. Predating those MacBooks is a collection of about thirty netbooks, or sub-notebooks: computers that are inexpensive but are woefully underpowered. 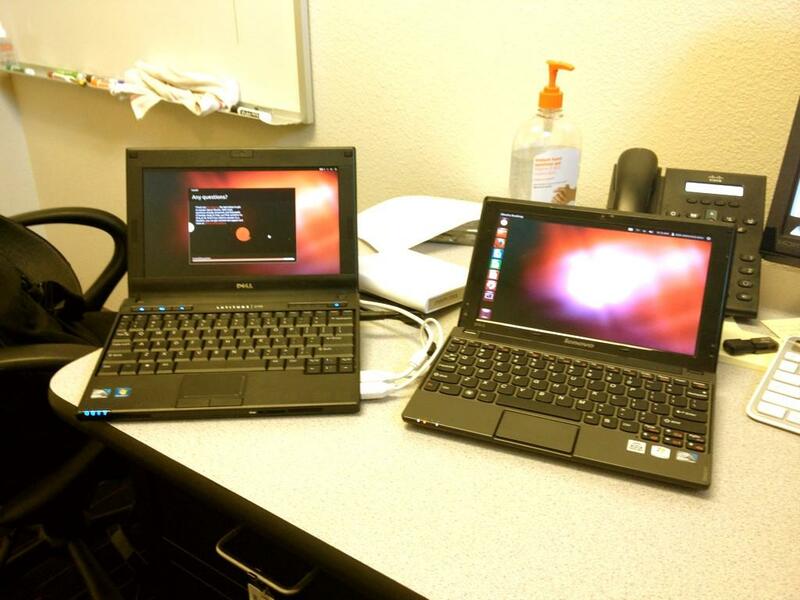 On a good day, the netbooks could barely run Windows. On a bad day, they just didn’t work. While it’s the dream of many in the faculty as well as the school’s administration to replace those netbooks with MacBooks, that’s a pipe dream that won’t happen. The least expensive Mac notebook is $1,000; it’d be foolish to spend that money. We’ve got these netbooks so let’s make them work better. Seeing how Windows is too bloated for the limited processing power of these machines, I thought of experimenting with a different operating system on these machines: Ubuntu Linux, a free/libre operating system. The first post of five that outlines attainable solutions for making downtown Phoenix a great place to be. There’s been a lot made about that op-ed in Sunday’s edition of The Arizona Republic about downtown Phoenix. Personally, I thought it was full of aspirational platitudes that could easily be applied to Pittsburgh as much as Phoenix or Poughkeepsie. But, like the attention-craved downtowners that we are, any publicity is good and we have to go at it and spin our way through it. I read through the piece a couple times and it seemed like a generic consultant’s report instead of a piece that offered solutions tailored to our desert downtown. And, after reading through the piece a couple times, I was very confused. It didn’t offer any new ideas or concepts for our downtown. It talked on and on about educational issues, something that downtown inherently cannot solve. In other words, it didn’t do anything for me. And reading through the blogs and Twitter streams of some of downtown’s most critical thinkers, who bought in to that op-ed, I was very dismayed. It’s time for an honest look at downtown’s priorities. Over the next four Tuesdays, I’m going to shine a light on those priorities. 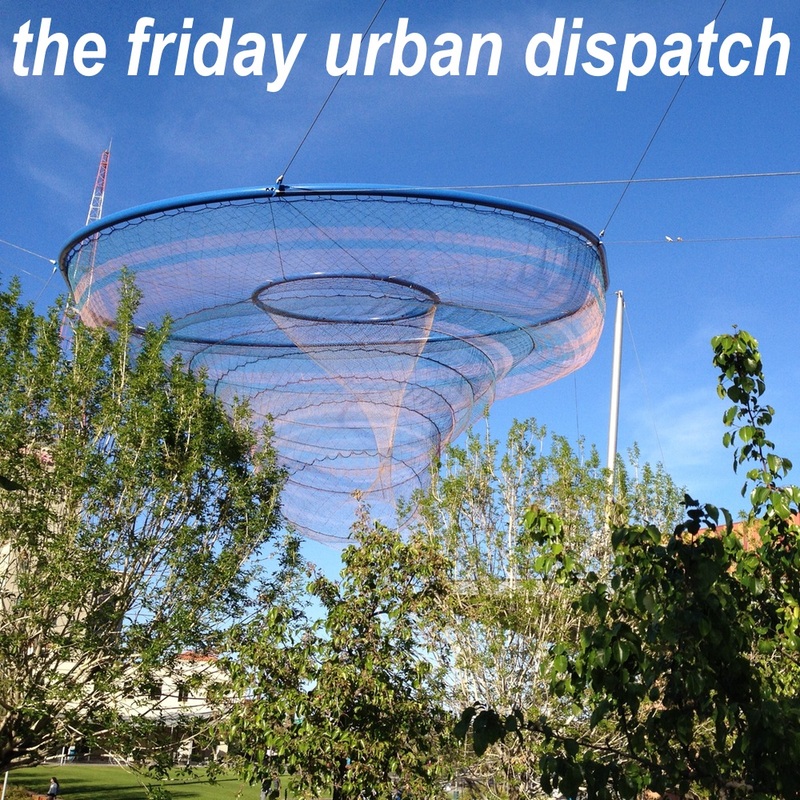 Some of the priorities can be applied to downtowns and urban areas in general. Some of them are uniquely Phoenix needs. 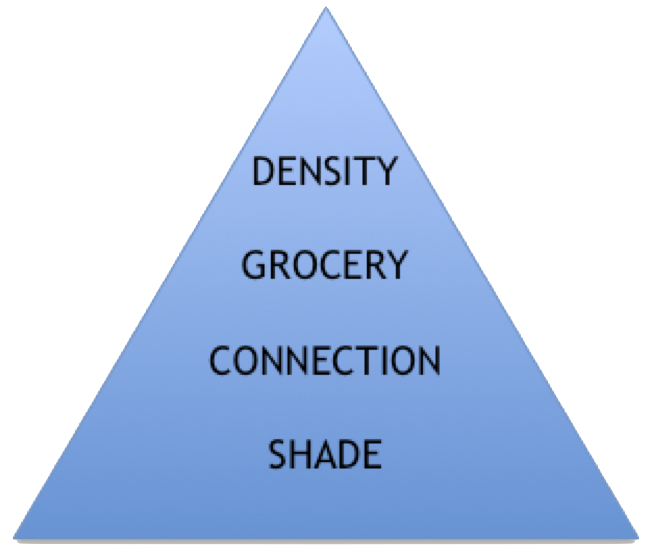 Which leads me to this: I’m prepared to argue that downtown Phoenix’s four priority areas should be shade, connection, grocery, and density. I really don’t like to employ the overused Maslow’s Hierarchy of Needs because it’s just that: overused. But each of the areas here build on each other. In downtown Phoenix, that bottommost level would be shade. Hot summers aren’t a new invention for Phoenix, even the Hohokam had to deal with them. (We’ve just made them hotter by clear-cutting agricultural fields around the urban core to make way for exurban development.) If one looks at recent architecture in Phoenix, one could reasonably deduct that it doesn’t get warm here. The next level up on that hierarchy is connection. Urban areas require connection by non-automobile needs. The connections, however, aren’t there. Bike lanes exist in islands and vacuums by themselves. Key parts of our downtown, like Grand Avenue, aren’t connected to the rest of the Phoenix public transportation system. Light rail is a wonderful asset to the community but very few spur lines from that initial twenty-mile starter line have been contemplated; I doubt the usefulness of those lines that have been considered. Another level up is grocery. Perhaps this is a uniquely Phoenix case since we don’t have a true walkable grocery store in our community. Need groceries? The nearest full-service grocery store to downtown Phoenix is a Safeway at 7th St and McDowell. Within downtown, there are two convenience stores and two mini-markets that sometimes don’t cut it. As much as we all loved the indoor Urban Grocery at the Downtown Phoenix Public Market, it had limited selection and high prices. Once you have these three fundamentals, then you can achieve the big thing that makes urban environments shine: DENSITY. (If you’ve been engaged with me in any sort of conversation lately, then you know that this is my constant rallying cry.) Consider the following: There are about thirty coffeehouses in downtown Phoenix, including independent places like Fair Trade and One Coffee and chains like Starbucks and Dutch Bros Coffee. There’s also a score of expensive “destination” restaurants in the same area. But who lives here? The biggest continuous population in downtown Phoenix is ASU students. Aside from a few others who live at 44 Monroe, the Orpheum Lofts, and Alta Lofts, that’s not a lot of non-ASU density.